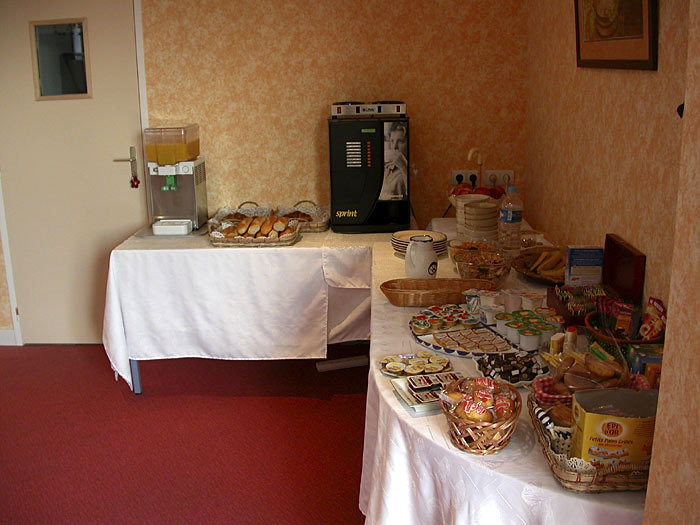 We woke in the Fasthotel in Saintes to have the breakfast buffet for about 6 euros each--a bargain, really: baguettes, croissants, butter, jam, coffee, hardboiled eggs, ham, yogurt, cereals, OJ, fruit, and more. We headed south again, driving through Perigueux in the Dordogne--a place we'd thought might be a good base for the region. We were not impressed: just another bustling small city with no special charm. We decided then to retrace some of our prior travel routes by heading on to Souillac. It was warm, partly cloudy, and the cypress trees and vineyards, pines and villages looked familiar and beautiful. We stopped in a tiny village, Neuvic, for an outdoor lunch. We had to cope with construction delays on our way to Brive, where the autoroute allowed us to zoom down to Souillac, our "home" during a couple former trips to France. We got a balcony room in the Hotel de Quercy overlooking the pool, with 3 opening doors onto the balcony. We read the papers and walked the familiar town. Dinner reservations were made at one of our favorite restaurants: La Beffroi. We had an excellent Cahors red wine with a much too large and delicious dinner. We won't order two full "menus" again! We were happy to be in the area again.